The Dutch audience caught Dexter at one of those nights, in top form. The fortunate event in the fall of 1972 is documented on the 2LP All Souls’. In a letter to his friends in Copenhagen from October 12, 1972, Dexter Gordon expressed his joy of touring the Continent with a regular Dutch trio: ‘Dear Folks, this is ‘den gamle rejsemusiker (the old traveling musician) letting the folks back home know that I’m ok and am defending the colors! This tour is quite fantastic; we are traveling through Holland, Germany, Luxembourg, Belge and France! It’s six weeks no, seven weeks and I’m getting rich! Anyway, it’s very well organized and seems to be a success. For the most part I’m working with the same group… Hope everything is in order. Love, Absalon (Gordonson).’ (from: liner notes Fried Bananas, Gearbox 2017) Gordon referred to pianist Rein de Graaff, bassist Henk Haverhoek and drummer Eric Ineke, a superb trio that had been rapidly developing into one of Europe’s finest mainstream jazz units. Another excellent pianist, Rob Agerbeek, also played regularly with the Sophisticated Giant. It is Agerbeek, together with Haverhoek and Ineke, who’s present at the Haagse Jazz Club on November 2, 1972, the Roman-Catholic All Souls, a night, the pianist describes in the liner notes to the album, he was unlikely to forget: ‘Why Dexter was at the top of his game that Thursday evening in November… I don’t know. But he was! Dexter was a bit languid from the Indonesian meal when we arrived at the club. I was afraid that it would turn out to be a routine job. But Dexter helped us out of the dream once he’d set in You Stepped Out Of A Dream! He was very inspiring. And the repertoire was diverse and a bit out of the ordinary. I had never played Stablemates up to then, although I kind of knew the chord sequence’. Dead honest Agerbeek. Indeed, on the recording one can just barely hear Agerbeek answer ‘I don’t know that one’ to Gordon’s call of the tune. The accomplished Agerbeek knew enough of it to deliver a fine performance. Before signing off with the quartet’s signatures, the Indonesia-born pianist proceeded to map out the chord progression matter-of-factly. (see below) Perhaps for passionate future stablemates to study. Early seventies, bicycle race. Do not try this in Copenhagen. It would be four years before Long Tall Dex made a great comeback in The United States. In Europe, where Gordon had been living since the early sixties, the tenor sax giant, largely responsible for translating the bebop language to the tenor saxophone two decades ago, having acquired the appropriately legendary status through his Blue Note albums of the early and mid-sixties, was highly acclaimed and in demand. His output of the last few years had been either stunning (1970’s The Panther) or excellent (1970’s The Jumpin’ Blues, 1972’s Ca’Purange and Generation). On stage, provided Gordon was relatively sober, he got going like few could. Unparalleled momentum. What’s the secret of Dexter Gordon’s strong jazz personality? There always a certain mystique as to how jazz men and women transform their particular emotions and ideas from their instrument into the sounds for the audiences to enjoy. It’s part of the charm of that particular form of art and entertainment we call jazz. Evidently, Gordon’s sound is incredibly big and clear. He favors fat, sustained notes and builds long-flowing sentences, with only the occasional fast bop flurry of notes. He’s a terrific storyteller. I like to think of his stories as an ongoing rush of waves in the sea, new sensations seemingly coming from nowhere again and again, sensations that follow the preceding ones with natural ease. Moreover, Gordon plays lazily behind the beat, creating much tension. Dexter Gordon is also a humorous player who slyly and intelligently sprinkles his stories with quotes. Not to mention an unequaled giant of ballad interpretation. Gordon’s regular ride on the tonic, a tool that weakens the impact of solos by more inexperienced players, functions as the glue between his sentences in combination with his authentic sound, storytelling and time. Obviously, both Stablemates and Some Other Blues, which fill the first LP of the album, offer abundant proof of Gordon’s unique attractiveness. Between them, arguably the former consists of Gordon’s greatest tale, while the latter sustains the most luscious hotbed of blues phrases. Stablemates is introduced comically by Gordon as ‘Benny Golson’s Stablemates… Stablemates… Stable Mable, keep your elbow off my table…’. Gordon, firing on all cylinders, is duly stimulated by the rhythm section. Henk Haverhoek is grooving relentlessly, Eric Ineke peppers Gordon’s strong-muscled tales with well-placed, propulsive bass drum and cymbal accents. During the trio’s hard-swinging moment of truth, Rob Agerbeek’s solo bears the mark of Horace Silver’s wise motto of meaningful simplicity, as he swings with clear, percussive lines, mostly in the middle register. The way Gordon grabs a tune by the throat, in this instance John Coltrane’s Some Other Blues, is rather amazing. He dives headlong into a solo marked by constantly interesting combinations of blues phrases and poignant rhythmic variation, definitely an auditory hieroglyph for future generations to dissect and enjoy. Ineke’s probing and resourceful demonstration of cymbal crashes and press rolls and Rob Agerbeek’s surprising mélange of funky blues licks and sneaky dissonant cadenzas, add charm to the group’s take on Some Other Blues. Interesting choice of repertory, presenting further evidence to the well-known fact that, while Dexter Gordon influenced the young John Coltrane, he was also in turn inspired by Coltrane. Supposedly, Gordon’s vocal performance of Billy Eckstine’s Jelly Jelly was meant as a breather, part hokum, part loose blues exercise. Johnny Mandel’s ballad The Shadow Of Your Smile brings the band back to serious business. At times heartbreaking, Gordon’s melancholic sentences stay close to the tune’s story of doomed love, which was written by Mandel for the movie The Sandpiper. It’s plainly superb. Last but not least, You Stepped Out Of A Dream is hard-driving, the immediate playful variation on the theme by Gordon suave and swinging. Again, Gordon stretches out, crossing the ten minute line, and never a dull moment. Indeed, All Souls captures Long Tall Dex at ease and in top form, and the Dexterity label’s one and only album release is a priceless document. All Souls is only available on vintage vinyl. It’s about time for a CD and/or vinyl reissue of this important slice of Dexter Gordon and Dutch jazz, 45 years after the fact. Below is the link to Stablemates, released on drummer Eric Ineke’s album from 2017, Let There Be Life, Love And Laughter: Eric Ineke Meets The Tenor Players. 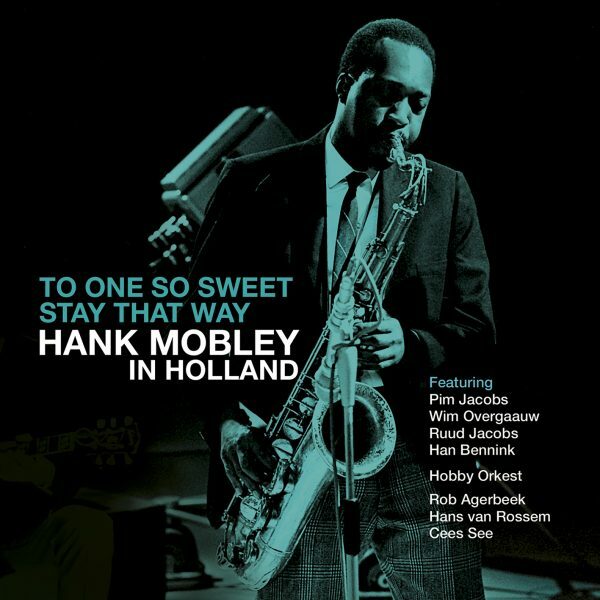 ROB AGERBEEK/HANK MOBLEY – Just recently, the Dutch Jazz Archive released To One So Sweet Stay That Way: Hank Mobley In Holland. (See review here.) A great document that fills the musical gaps of Mobley’s ten-day stay in The Netherlands in 1967. A big part of the CD is dedicated to Mobley’s gig at Rotterdam’s club B14 with the Rob Agerbeek Trio. More than enough reason to get in touch with veteran hard bop, boogie-woogie and swing pianist Rob Agerbeek and ask about his recollections with the revered tenor saxophonist. FM: How did that gig came about? FM: It must’ve been quite something to meet Hank Mobley before the show. I was thinking, Jesus Christ, I better set my best foot forward on stage! But it turned out pretty well. FM: It was a one-off trio, right? RA: Yes. I hadn’t played with bass player Hans van Rossem. But I was familiar with drummer Cees See. FM: Was the setlist discussed or did Mobley counted off the tunes on the spot? RA: Basically, he called a tune and asked if that was ok. Very nice. FM: The sound quality, quite logically, isn’t fantastic. But you can hear you’re a bed of roses for him, despite the fact that he sounds a bit fatigued as well. You were already a very accomplished player and, naturally, familiar with standards like Autumn Leaves and Like Someone In Love. Mobley’s Three-Way Split was a lesser-known affair. Oddly enough, it’s the swinginest tune! RA: I knew that tune from the album with Andrew Hill on piano. (No Room For Squares, FM) Yes, Hank liked my playing, afterwards he invited me for a gig to Paris. Sometime later we played at the American School in Paris with Art Taylor, trumpeter Dizzy Reece and bass player Jimmy Woode. Mobley had a session in Paris and wanted me in on it. But Francis Wolff had already booked another pianist, Vince Benedetti. Mobley was rather peeved about being overruled. It turned out to be the album The Flip. FM: At least now your cooperation with Mobley in Holland is preserved for posterity. RA: O yeah, it’s a wonderful job by the Dutch Jazz Archive. I’m very honored. I also really like those tunes with the Hobby Orkest. FM: Mobley in a big band setting, really surprising. The context suits Mobley very well, he’s in great form. It would’ve been really nice if Mobley would’ve done a big band album in his lifetime. RA: Yes, absolutely. Well, early in his career Mobley did play in Dizzy Gillespie’s band, of course. Find To One So Sweet Stay That Way: Hank Mobley In Holland here.